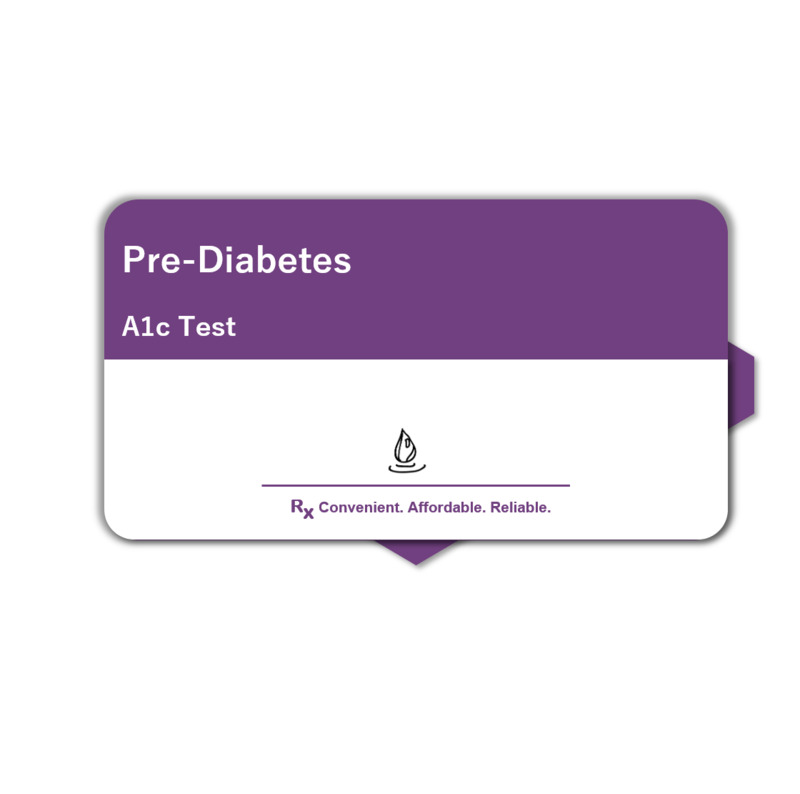 The A1c or pre-diabetic test will measure HbA1c levels. A physician will review the results to assess your risk of developing diabetes. Unlike a daily diabetes test, it measures average glucose levels over 3 months. The test also helps those with diabetes to monitor their quarterly glucose levels. HbA1c (or hemoglobin A1c or glycohemoglobin) is a minor component of hemoglobin to which glucose is bound. Hemoglobin is an iron containing protein in red blood cells that gives the red color to blood. Hemoglobin is responsible for carrying oxygen throughout the body. Since glucose binds to HbA1c, higher levels indicate higher glucose levels. As the red blood cells have a life span of about 90 days, the HbA1c test is a good indicator of average glucose levels over a period of 3 months. HbA1c is not influenced by the daily variations of glucose but gives average value over a long period. It can not replace the daily glucose monitoring for those with diabetes. However, it is a useful test to measure levels over longer period for those with diabetes or pre-diabetes. What are the signs of high A1c levels? Those with possible signs of diabetes see unusual thirst and urinating, fatigue, and itching. Sugar craving is also frequently observed and it takes longer for wounds to heal. Heredity plays a big role in diabetes and those with a family history of diabetes should test their A1c levels regularly. How to check A1c levels? The easiest low-cost way to get tested for A1c is from the convenience of your home. Simply order an HbA1c test kit, collect a few drops of blood on a tissue paper, send your sample to our CLIA-certified labs to find out your levels within a week. For a short description for A1c ranges, you can read the Medline.gov page on HbA1c test. For understanding the difference between A1c and eAG, the average glucose levels, please see the American Diabetes Association’s page on A1c. You can also order a separate test to understand your cardiovascular risk from higher HbA1c using at-home Cholesterol and Heart Health test. A: The kit for our at-home HbA1c test contains a blood card to collect few droplets of blood, a pair of lancets for finger-pricking, instructions on how to collect the sample, and a form requesting basic information including date and time of collection. The directions are straight forward and easy to follow. A: The report with your A1c test results will be easy to understand and will have all the necessary details. It will mark your A1c levels on a range expected for healthy levels. The report will also specify what are the expected low and high ranges. It will briefly discuss what your numbers mean and what next steps should be taken to maintain healthy levels. Q: Can you recommend what therapy should I take if my levels are high? A: Unfortunately, no. As a lab test provider we can only test and report out data from your samples. We are not authorized to provide any medical recommendations. But we strongly encourage you to discuss the results with your doctor for next steps. It is recommended to monitor the HbA1c levels every 3 months for healthy glucose levels. A quick pre-diabetic (HbA1c) test ordered from home can help check your glucose levels to assess whether you need to make any life style changes to bring your numbers to normally recommended levels. At-home HbA1c test from RxHomeTest.com can help you understand your potential risk of diabetes or, for those with diabetes, potential risks from high sugar levels. High levels of HbA1c are indicators of higher glucose in blood and may require dietary and life style adjustments. An at-home pre-diabetic (HbA1c) test can help you find your levels right from the comfort of your home. Better health results in better quality of life, and a regular at-home HbA1c test from RxHomeTest.com can offer insight not only into various health symptoms, but it can serve as a motivation to treat each of these symptoms and have a better quality of life! Still wondering where to get an A1c test? RxHomeTest.com is one of the best places to get A1c tested as we process your tests at the same CLIA-Certified labs that other physicians use but no lab or doctor visit is required. So rest assured that your blood test to check A1c levels is being processed in a world class lab. RxHomeTest.com offers one of the best tests for A1c with convenient, confidential, and reliable results at some of the lowest prices in the market. At-home pre-diabetic (A1c) test is quick and easy, can be ordered online, and doesn’t require a doctor’s visit or prescription. This saves time and money on visits to the doctor and the lab. The at-home A1c test ordered at RxHomeTest.com, requires just few drops of blood using a finger-prick (instead of vials of blood taken through venipuncture). The test includes a doctor’s prescription and review, two day free return shipping, and you get results within a week.